The Olympic Games are coming up! This summer, a very special global community will come together in London and make athletic history. And now, you have an opportunity to introduce your students to that community. The Olympic Games are full of teachable moments. They’ve got it all: diverse cultures and traditions, opportunities to break down stereotypes, exciting competitions, connections to just about every curricular area, and a basis in real-life events. So are you looking for a way to spice up your springtime? Try some of these fun Olympic ideas. Have your students measure out areas needed for track and field events. Then have them try out the sports and time each other in the races with a stopwatch. For more advanced students, this activity is a great opportunity to learn about the metric system. Have them measure the distances of track events in meters and yards to get an idea of the units of measurement, then explain how and where each form of measurement is commonly used. Another idea is to teach your students about nutrition and the healthy choices Olympic athletes make. You can also teach science concepts like friction, aerodynamics, velocity, and more by exploring the equipment athletes use. Create an Olympic Map by marking a world map with the location of each past host city of the Olympic Games. Add historical information or create a corresponding timeline along your classroom wall. Have students add information as they learn more about the history of the Olympic Games and the countries that have hosted it. Or, you can have students act out key Olympic events and customs from both the Modern and Ancient Games. Teach about money or flags from around the world, or teach about Olympic symbols and customs. 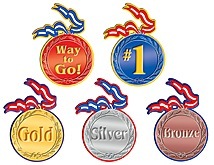 Have students research Olympic facts for a trivia game, then play the game as a class! To broaden students’ minds about what human beings are capable of, teach them about the Paralympic Games and the amazing athletes who compete. To make the lesson more personal, have them research a specific athlete, learn about athletes who have competed in both the Olympic Games and the Paralympics, learn about some of the special equipment athletes with disabilities use, watch video clips (you can find some at videos.disabled-world.com/category/paralympics), or write a story about someone competing in the Paralympic Games. Have your students write a letter to a favorite Olympic athlete, write a news article based on a clip from a previous Olympiad (for video clips, go to www.olympic.org), read about famous athletes, script a sportscast based on an imaginary competition, or design a new Olympic sport. Study Olympic vocabulary and hold an Olympic Spelling Bee with medals or olive wreaths for the winners! For more fun, go to www.london2012.com/mascots so students can learn about and play with the 2012 Olympic mascots, Wenlock and Mandeville. Hold a class- or school-sized Olympic Games and have students create mascots, medals, a torch, and more. Looking for a fun reward for your hard-working students? Let them make Olympic Sport trading cards. And finally, have students make Keeping Track books so they can record their experiences following the Olympic Games over the summer.